There are a number of different companies that sell or lease portable storage containers for businesses. This blog post will serve as a Portable Storage Container Guide to help you differentiate some of the companies that sell or rent storage containers. If you are searching for portable storage container companies, you should always do your own homework. Here are a few suggestions about the main things to look for when searching for portable storage containers for your business. Size of the container needed? Is the company easy to deal with and has a local presence? 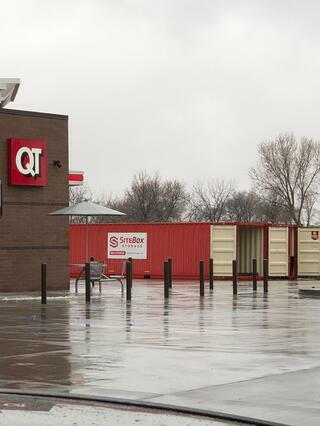 SiteBox Storage is an industry leader when it comes to portable storage containers and mobile offices. The company, in business since 1998, is the go-to storage solutions for companies in Kansas, Oklahoma and Texas. SiteBox Storage offers the industry’s most responsive and reliable customer service, as well as unmatched logistics and one of the largest fleets of portable storage units, mobile offices and even combo units. Mobile Mini is also a solid supplier of portable storage containers. Like SiteBox, they have a range of products, and mobile offices. They just have a different philosophy around service. Customers who have switched from Mobile Mini to SiteBox Storage, often tell us that there is a marked difference between the two companies in the areas of timely delivery AND pickup, quality of the unit itself, and that it’s so much easier to get in touch with a local SiteBox Storage sales person. You can’t beat the kind of service that SiteBox delivers. One company that gets mentioned often is PODS. The reason it gets mentioned is that it is a consumer-driven solution. They’ve made a name for themselves in recent years because of their focus on consumer storage and moving solutions. It’s no longer uncommon to see a PODS container out in the driveway of the neighbor you heard was moving. However, that is where the comparison ends. While they do have a business/government offering, their solutions are simply not a comparable product. The containers they use are non-standard sizes. They are available only for short term leases and they use a proprietary lift system to be moved or transported, rather than standard ISO sizes. This can limit access and the ability to move the storage container. At the time of this writing, PODS does not offer portable offices or combo units . While they do have an impressive network of coverage, they are primarily a solution designed to make moving easier for consumers. They are very simply not a solution for portable storage containers and mobile offices for businesses. One of the considerations to make when considering a portable storage container is how long you’ll need it. This may determine whether you buy storage containers or lease. Will you need it for a just a few short weeks or months? Do you need it for an extended time? When you compare storage container companies, make sure they allow you to get what you need, on your terms. SiteBox Storage offers three options to suit your needs. Purchase a portable storage container – there are new and used units available. Choose from a large selection of inventory and have it delivered to your location. Lease a portable storage container – this option allows you to use it when you need it. The units are always delivered and picked up promptly and a 28-day billing cycle makes it easy. If you know you’ll need storage for only a temporary time until a project is finished, storage container rental is the way to go. Lease to own a portable storage container – if storage container rental is not right for you, but you simply don’t have the capital to buy, SiteBox Storage can still help. With a small down payment and easy financing through our partner, Belt Leasing, you can own your unit in just 2 to 5 years. Like any good reference will do, this Storage Container Guide will tell you that the choice you make is ultimately yours. All we can do is offer advice on the questions to ask, and the considerations to make. (And though we mention other companies, we are in no way affiliated with either Mobile Mini or Pods.) When it comes to portable storage solutions in Kansas, Oklahoma and Texas, SiteBox Storage is the best choice.